Not to be confused with Cosmolabe or Astrolabe (ship). For other pages with a similar name, see Astrolabe (disambiguation). A modern astrolabe made in Tabriz, Iran in 2013. An astrolabe made of gilded brass from about 1540–70. The Canterbury Astrolabe Quadrant, England, 1388. A 16th-century astrolabe showing a tulip rete and rule. 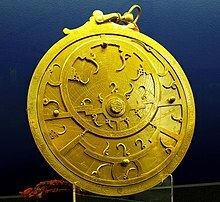 An astrolabe (Greek: ἀστρολάβος astrolabos; Arabic: ٱلأَسْطُرلاب‎ al-Asturlāb; Persian: اِستاره یاب‎ Astaara yab) is an elaborate inclinometer, historically used by astronomers and navigators to measure the altitude above the horizon of a celestial body, day or night. It can be used to identify stars or planets, to determine local latitude given local time (and vice versa), to survey, or to triangulate. It was used in classical antiquity, the Islamic Golden Age, the European Middle Ages and the Age of Discovery for all these purposes. The astrolabe's importance not only comes from the early development of astronomy, but is also effective for determining latitude on land or calm seas. Although it is less reliable on the heaving deck of a ship in rough seas, the mariner's astrolabe was developed to solve that problem. OED gives the translation "star-taker" for the English word astrolabe and traces it through medieval Latin to the Greek word astrolabos, from astron "star" and lambanein "to take". In the medieval Islamic world the Arabic word "al-Asturlāb" (i.e. astrolabe) was given various etymologies. In Arabic texts, the word is translated as "ākhdhu al-Nujuum" (Arabic: آخِذُ ٱلنُّجُومْ‎, lit. "star-taker"), a direct translation of the Greek word. Al-Biruni quotes and criticizes medieval scientist Hamzah al-Isfahani who stated: "asturlab is an arabization of this Persian phrase" (sitara yab, meaning "taker of the stars"). In medieval Islamic sources, there is also a folk etymology of the word as "lines of lab", where "Lab" refers to a certain son of Idris (Enoch). This etymology is mentioned by a 10th-century scientist named al-Qummi but rejected by al-Khwarizmi. An early astrolabe was invented in the Hellenistic civilization by Apollonius of Perga between 220 and 150 BC, often attributed to Hipparchus. The astrolabe was a marriage of the planisphere and dioptra, effectively an analog calculator capable of working out several different kinds of problems in astronomy. Theon of Alexandria (c. 335 – c. 405) wrote a detailed treatise on the astrolabe, and Lewis argues that Ptolemy used an astrolabe to make the astronomical observations recorded in the Tetrabiblos. The invention of the plane astrolabe is sometimes wrongly attributed to Theon's daughter Hypatia (c. 350–370; died 415 AD), but it is, in fact, known to have already been in use at least 500 years before Hypatia was born. The misattribution comes from a misinterpretation of a statement in a letter written by Hypatia's pupil Synesius (c. 373 – c. 414), which mentions that Hypatia had taught him how to construct a plane astrolabe, but does not state anything about her having invented it herself. Astrolabes continued in use in the Greek-speaking world throughout the Byzantine period. About 550 AD, Christian philosopher John Philoponus wrote a treatise on the astrolabe in Greek, which is the earliest extant treatise on the instrument. [a] Mesopotamian bishop Severus Sebokht also wrote a treatise on the astrolabe in the Syriac language in the mid-7th century. [b] Sebokht refers to the astrolabe as being made of brass in the introduction of his treatise, indicating that metal astrolabes were known in the Christian East well before they were developed in the Islamic world or in the Latin West. Animation showing how celestial and geographic coordinates are mapped on an astrolabe's tympan through a stereographic projection. Hypothetical tympan (40° north latitude) of a 16th-century European planispheric astrolabe. Astrolabes were further developed in the medieval Islamic world, where Muslim astronomers introduced angular scales to the design, adding circles indicating azimuths on the horizon. It was widely used throughout the Muslim world, chiefly as an aid to navigation and as a way of finding the Qibla, the direction of Mecca. Eighth-century mathematician Muhammad al-Fazari is the first person credited with building the astrolabe in the Islamic world. The mathematical background was established by Muslim astronomer Albatenius in his treatise Kitab az-Zij (c. 920 AD), which was translated into Latin by Plato Tiburtinus (De Motu Stellarum). The earliest surviving astrolabe is dated AH 315 (927–28 AD). In the Islamic world, astrolabes were used to find the times of sunrise and the rising of fixed stars, to help schedule morning prayers (salat). In the 10th century, al-Sufi first described over 1,000 different uses of an astrolabe, in areas as diverse as astronomy, astrology, navigation, surveying, timekeeping, prayer, Salat, Qibla, etc. The spherical astrolabe was a variation of both the astrolabe and the armillary sphere, invented during the Middle Ages by astronomers and inventors in the Islamic world. [c] The earliest description of the spherical astrolabe dates back to Al-Nayrizi (fl. 892–902). In the 12th century, Sharaf al-Dīn al-Tūsī invented the linear astrolabe, sometimes called the "staff of al-Tusi", which was "a simple wooden rod with graduated markings but without sights. It was furnished with a plumb line and a double chord for making angular measurements and bore a perforated pointer". The geared mechanical astrolabe was invented by Abi Bakr of Isfahan in 1235. Herman Contractus, the abbot of Reichman Abbey, examined the use of the astrolabe in Mensura Astrolai during the 11th century. Peter of Maricourt wrote a treatise on the construction and use of a universal astrolabe in the last half of the 13th century entitled Nova compositio astrolabii particularis. Universal astrolabes can be found at the History of Science Museum in Oxford. English author Geoffrey Chaucer (c. 1343–1400) compiled A Treatise on the Astrolabe for his son, mainly based on a work by Messahalla or Ibn al-Saffar. The same source was translated by French astronomer and astrologer Pélerin de Prusse and others. The first printed book on the astrolabe was Composition and Use of Astrolabe by Christian of Prachatice, also using Messahalla, but relatively original. In 1370, the first Indian treatise on the astrolabe was written by the Jain astronomer Mahendra Suri. A simplified astrolabe, known as a balesilha, was used by sailors to get an accurate reading of latitude while out to sea. The use of the balesilha was promoted by Prince Henry (1394–1460) while out navigating for Portugal. The first known metal astrolabe in Western Europe is the Destombes astrolabe made from brass in tenth-century Spain. Metal astrolabes avoided the warping that large wooden ones were prone to, allowing the construction of larger and therefore more accurate instruments. Metal astrolabes were heavier than wooden instruments of the same size, making it difficult to use them in navigation. The astrolabe was almost certainly first brought north of the Pyrenees by Gerbert of Aurillac (future Pope Sylvester II), where it was integrated into the quadrivium at the school in Reims, France sometime before the turn of the 11th century. In the 15th century, French instrument maker Jean Fusoris (c. 1365–1436) also started remaking and selling astrolabes in his shop in Paris, along with portable sundials and other popular scientific devices of the day. Thirteen of his astrolabes survive to this day. One more special example of craftsmanship in early 15th-century Europe is the astrolabe designed by Antonius de Pacento and made by Dominicus de Lanzano, dated 1420. In the 16th century, Johannes Stöffler published Elucidatio fabricae ususque astrolabii, a manual of the construction and use of the astrolabe. Four identical 16th-century astrolabes made by Georg Hartmann provide some of the earliest evidence for batch production by division of labor. 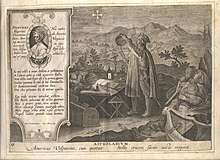 Amerigo Vespucci observing the Southern Cross with an Astrolabium, by Jan Collaert II. Museum Plantin-Moretus, Antwerp, Belgium. Mechanical astronomical clocks were initially influenced by the astrolabe; they could be seen in many ways as clockwork astrolabes designed to produce a continual display of the current position of the sun, stars, and planets. For example, Richard of Wallingford's clock (c. 1330) consisted essentially of a star map rotating behind a fixed rete, similar to that of an astrolabe. Many astronomical clocks use an astrolabe-style display, such as the famous clock at Prague, adopting a stereographic projection (see below) of the ecliptic plane. In recent times, astrolabe watches have become popular. For example, Swiss watchmaker Dr. Ludwig Oechslin designed and built an astrolabe wristwatch in conjunction with Ulysse Nardin in 1985. Dutch watchmaker Christaan van der Klauuw also manufactures astrolabe watches today. The Hartmann astrolabe in Yale collection. This instrument shows its rete and rule. Celestial Globe, Isfahan (? ), Iran 1144. Shown at the Louvre Museum, this globe is the third oldest surviving in the world. An astrolabe consists of a disk, called the mater (mother), which is deep enough to hold one or more flat plates called tympans, or climates. A tympan is made for a specific latitude and is engraved with a stereographic projection of circles denoting azimuth and altitude and representing the portion of the celestial sphere above the local horizon. The rim of the mater is typically graduated into hours of time, degrees of arc, or both. Above the mater and tympan, the rete, a framework bearing a projection of the ecliptic plane and several pointers indicating the positions of the brightest stars, is free to rotate. These pointers are often just simple points, but depending on the skill of the craftsman can be very elaborate and artistic. There are examples of astrolabes with artistic pointers in the shape of balls, stars, snakes, hands, dogs' heads, and leaves, among others. The names of the indicated stars were often engraved on the pointers in Arabic or Latin. Some astrolabes have a narrow rule or label which rotates over the rete, and may be marked with a scale of declinations. The rete, representing the sky, functions as a star chart. When it is rotated, the stars and the ecliptic move over the projection of the coordinates on the tympan. One complete rotation corresponds to the passage of a day. The astrolabe is, therefore, a predecessor of the modern planisphere. On the back of the mater, there is often engraved a number of scales that are useful in the astrolabe's various applications. These vary from designer to designer, but might include curves for time conversions, a calendar for converting the day of the month to the sun's position on the ecliptic, trigonometric scales, and graduation of 360 degrees around the back edge. The alidade is attached to the back face. An alidade can be seen in the lower right illustration of the Persian astrolabe above. When the astrolabe is held vertically, the alidade can be rotated and the sun or a star sighted along its length, so that its altitude in degrees can be read ("taken") from the graduated edge of the astrolabe; hence the word's Greek roots: "astron" (ἄστρον) = star + "lab-" (λαβ-) = to take. ^ Modern editions of John Philoponus' treatise on the astrolabe are De usu astrolabii eiusque constructione libellus (On the Use and Construction of the Astrolabe), ed. Heinrich Hase, Bonn: E. Weber, 1839, OCLC 165707441 (or id. Rheinisches Museum für Philologie 6 (1839): 127–71); repr. and translated into French by Alain Philippe Segonds, Jean Philopon, traité de l'astrolabe, Paris: Librairie Alain Brieux, 1981, OCLC 10467740; and translated into English by H.W. Green in R.T. Gunther, The Astrolabes of the World, Vol. 1/2, Oxford, 1932, OL 18840299M repr. London: Holland Press, 1976, OL 14132393M pp. 61–81. ^ O'Leary, De Lacy (1948). How Greek Science Passed to the Arabs. Routledge and Kegan Paul. "The most distinguished Syriac scholar of this later period was Severus Sebokht (d. 666–7), Bishop of Kennesrin. [...] In addition to these works [...] he also wrote on astronomical subjects (Brit. Mus. Add. 14538), and composed a treatise on the astronomical instrument known as the astrolabe, which has been edited and published by F. Nau (Paris, 1899)." Severus' treatise was translated by Jessie Payne Smith Margoliouth in R.T. Gunther, Astrolabes of the World, Oxford, 1932, pp. 82–103. ^ Savage-Smith, Emilie (1993). "Book Reviews". Journal of Islamic Studies. 4 (2): 296–299. doi:10.1093/jis/4.2.296. There is no evidence for the Hellenistic origin of the spherical astrolabe, but rather evidence so far available suggests that it may have been an early but distinctly Islamic development with no Greek antecedents. ^ Morrison, Robert G. (2013). "Islamic Astronomy". In Lindberg, David C.; Shank, Michael H. The Cambridge History of Science. 2, Medieval Science. Cambridge: Cambridge University Press. p. 115. ISBN 978-0-521-59448-6. Retrieved 15 May 2018. ^ In the Islamic world, it was used to navigate deserts, then oceans, and to calculate the direction to Mecca. ^ Northrup, Cynthia Clark; Bentley, Jerry H.; Eckes Jr., Alfred E. (2015). Encyclopedia of World Trade: From Ancient Times to the Present. Taylor and Francis, 2015. p. 72. ISBN 9781317471530. ^ "Astrolabe". Oxford English Dictionary (2nd ed.). 1989. ^ "Online Etymology Dictionary". Etymonline.com. Retrieved 2013-11-07. ^ a b King 1981, p. 44. ^ King 1981, p. 51. ^ King 1981, p. 45. ^ Michael Deakin (August 3, 1997). "Ockham's Razor: Hypatia of Alexandria". ABC Radio. Retrieved July 10, 2014. ^ a b c d Theodore, Jonathan (2016). The Modern Cultural Myth of the Decline and Fall of the Roman Empire. Manchester, England: Palgrave, Macmillan. p. 183. ISBN 978-1-137-56997-4. ^ a b c d Deakin, Michael A. B. (2007). Hypatia of Alexandria: Mathematician and Martyr. Amherst, New York: Prometheus Books. pp. 102–104. ISBN 978-1-59102-520-7. ^ a b c d Bradley, Michael John (2006). The Birth of Mathematics: Ancient Times to 1300. New York City, New York: Infobase Publishing. p. 63. ISBN 9780816054237. ^ Sebokht, Severus. "Description of the astrolabe". Tertullian.org. ^ See p. 289 of Martin, L. C. (1923), "Surveying and navigational instruments from the historical standpoint", Transactions of the Optical Society, 24 (5): 289–303, Bibcode:1923TrOS...24..289M, doi:10.1088/1475-4878/24/5/302, ISSN 1475-4878. ^ "The Earliest Surviving Dated Astrolabe". HistoryOfInformation.com. ^ Dr. Emily Winterburn (National Maritime Museum), Using an Astrolabe, Foundation for Science Technology and Civilisation, 2005. ^ Lachièz-Rey, Marc; Luminet, Jean-Pierre (2001). Celestial Treasury: From the Music of Spheres to the Conquest of Space. Trans. Joe Laredo. Cambridge, UK: Cambridge University Press. p. 74. ISBN 978-0-521-80040-2. ^ O'Connor, John J.; Robertson, Edmund F., "Sharaf al-Din al-Muzaffar al-Tusi", MacTutor History of Mathematics archive, University of St Andrews . ^ Bedini, Silvio A.; Maddison, Francis R. (1966). "Mechanical Universe: The Astrarium of Giovanni de' Dondi". Transactions of the American Philosophical Society. 56 (5): 1–69. doi:10.2307/1006002. JSTOR 1006002. ^ Encyclopedia of world trade : from ancient times to the present. Northrup, Cynthia Clark, 1959– ([Enhanced Credo edition] ed.). Armonk, NY: Routledge. 2015. p. 72. ISBN 0765680580. OCLC 889717964. ^ Kunitzsch, Paul (1981). "On the authenticity of the treatise on the composition and use of the astrolabe ascribed to Messahalla". Archives Internationales d'Histoire des Sciences Oxford. 31 (106): 42–62. ^ Selin, Helaine (2008-03-12). Encyclopaedia of the History of Science, Technology, and Medicine in Non-Western Cultures. Springer Science & Business Media. p. 1335. ISBN 978-1-4020-4559-2. Paul Kunitzsch has recently established that the Latin treatise on the astrolabe long ascribed to Ma'sh'allah and translated by John of Seville is in fact by Ibn al-Saffar, a disciple of Maslama al-Majriti. ^ Encyclopedia of world trade : from ancient times to the present. Northrup, Cynthia Clark, 1959– ([Enhanced Credo edition] ed.). Armonk, NY: Routledge. 2015. p. 460. ISBN 0765680580. OCLC 889717964. ^ "Qantara – 'Carolingian' astrolabe". Qantara-med.org. Retrieved 2013-11-07. ^ Boyle, David (2011). Toward the Setting Sun: Columbus, Cabot, Vespucci, and the Race for America. Bloomsbury Publishing USA. p. 253. ISBN 9780802779786. .
^ "Astrolabium G. Galilei". Ulysse Nardin. Archived from the original on 2 January 2011. ^ "Christaan van der Klauuw". ^ a b Stephenson, Bruce; Bolt, Marvin; Friedman, Anna Felicity (2000). The Universe Unveiled: Instruments and Images through History. Cambridge, UK: Cambridge University Press. pp. 108–109. ISBN 0-521-79143-X. ^ "Star Names on Astrolabes". Ian Ridpath. Retrieved 2016-11-12. Evans, James (1998), The History and Practice of Ancient Astronomy, Oxford University Press, ISBN 0-19-509539-1 . Krebs, Robert E.; Krebs, Carolyn A. (2003), Groundbreaking Scientific Experiments, Inventions, and Discoveries of the Ancient World, Greenwood Press . Lewis, M. J. T. (2001), Surveying Instruments of Greece and Rome, Cambridge University Press . Morrison, James E (2007), The Astrolabe, Janus, ISBN 978-0-939320-30-1 . Wikisource has the text of the 1911 Encyclopædia Britannica article Astrolabe. Look up astrolabe in Wiktionary, the free dictionary. "Hello World!" for the Astrolabe: The First Computer Video of Howard Covitz's Presentation at Ignite Phoenix, June 2009. Slides for Presentation Licensed as Creative Commons by-nc-nd. Video of Tom Wujec demonstrating an astrolabe. Taken at TEDGlobal 2009. Includes clickable transcript. Licensed as Creative Commons by-nc-nd.